I wonder why Rodney Stark wrote this book. He claims there is a “sinister” (p. 4) trend in Crusader studies that characterizes the Muslim world as the innocent and culturally and morally far superior victim of this first manifestation of European colonialism. That “during the Crusades, an expansionist, imperialistic Christendom brutalized, looted, and colonized a tolerant and peaceful Islam” (p. 8). 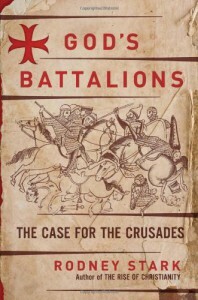 My problem may stem from the book’s subtitle: “The Case for the Crusades.” The case for the Crusades? Is he seriously arguing that a religiously motivated military campaign (jihad) is justified? Is he hypocritically arguing that you shouldn’t use selective data to support one’s opinion yet does so to exonerate Urban II and his successors? Or is his objective of a more contemporary nature? A backhanded justification for the West’s (primarily America’s) response to recent Islamic fundamentalist terrorism? If so, then the facts of his own book doesn’t support his interpretation. If anything, they argue against a military response: Despite better technology and amazing logistical capability on the part of the European princes, no Crusade after the first achieved any lasting success and most were utter debacles*). *The Fourth Crusade, indeed, perpetrated one of the worst cultural and political crimes in medieval history – the sacking of Constantinople and the utter ruin of the Byzantine state, threatening nary a Saracen. When Stark sticks to the facts and doesn’t attempt any interpretation, he’s generally spot on. It’s his interpretations that I found fault with in his latest work. I am still amazed and enthralled by The Rise of Christianity How the Obscure Marginal Jesus Movement Became the Dominant Religious Force ..... He marshaled ancient sources and applied modern sociological research on religious conversion to present a powerful case for how and why Christianity prospered even in the face of sporadic but usually fatal persecutions. And his description of life in ancient Antioch, in the same book, is still one of the most harrowing and interesting I’ve read. For the first 2/3rds of Discovering God The Origins of the Great Religions and the Evolution of Belief. And, while Wikipedia is never to be trusted as a source itself, the bibliography sections of the Crusade entries can direct interested parties to interesting books (e.g., http://en.wikipedia.org/wiki/First_crusade#Sources). A final thought that has nothing to do with my praises, objections or opinions of the book but which came to me as I was reading: Stark’s discussion of why Crusaders took up the cross and justified their actions reminded me of Wendy Doniger’s discussion of a similar moral dilemma that faced the kshatriya caste in her book The Hindus - see my review: http://www.goodreads.com/book/show/5263037-the-hindus. In the “Bhagavad Gita,” Krishna explains to Arjuna that though the warrior’s dharma (to commit acts of violence and murder in service to his ruler) goes against general dharma and accumulates bad karma, the warrior who can act (karma) without desire (kama) can satisfy both dharmas and avoid bad karma. It seems to me that, in a similar vein, Christianity resolved the problem of controlling its warrior class with theories of “just wars” and plenary absolution of sins committed.